The church is made up of people of various ages. We like to think that we are friendly and approachable and are glad to welcome visitors and newcomers. We endeavour to be contemporary and culturally aware in our church programmes. The ministry of the church stems from a belief that encountering Jesus changes us and brings purpose to our lives. As an Evangelical church we try and follow the teachings of the bible and seek to be open to the work of the Holy Spirit. 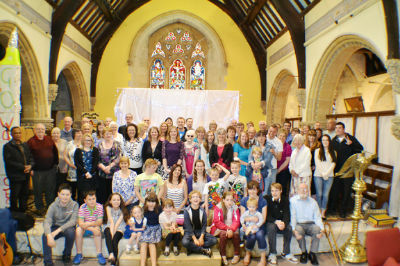 Christ Church is partnered with St Paul's, Shanklin with whom we share Rev. Mark Williams as Priest in Charge. Mark together with two other priests are part of a wider new team ministry which encompasses all 6 Anglican churches in the Sandown Bay Area. We also have excellent links with the local Church of England primary school (The Bay CE Primary School) which is a federated school with Niton Primary School. Working together, the newly named ‘Cornerstone Federation’ has members of the church on the Governing Body. Their website is bayceschool.org. From September 2018 The Bay became a through school now also covering Sandown High School.